A few days ago, some leaked images of the game appeared on 4Chan. (Important rule of the internet for you: Don't believe all the stuff you see leaking onto 4Chan. It isn't even close to a reliable source.) The user claimed that they were from next month's issue of a Japanese gaming magazine. 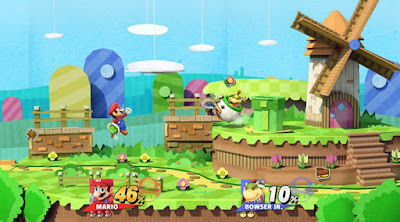 This one shows Mario and Bowser Jr. fighting. 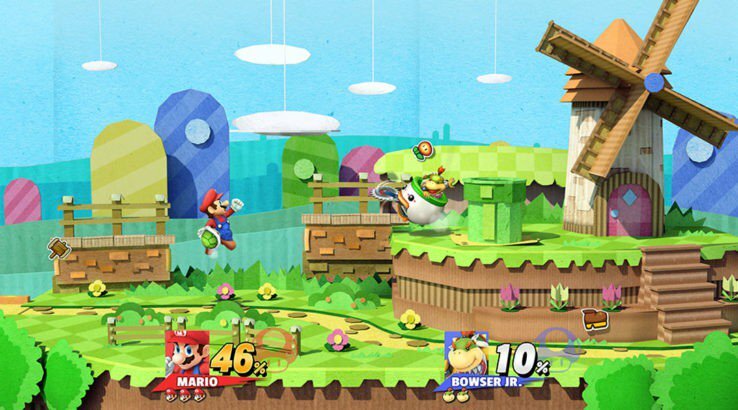 They are fighting in what appears to be a remastered version of the Paper Mario Stage (a 3DS version exclusive). This was perhaps the most convincing out of all the leaked images. If this was fake, then whoever made it definitely put a lot of effort into doing so. 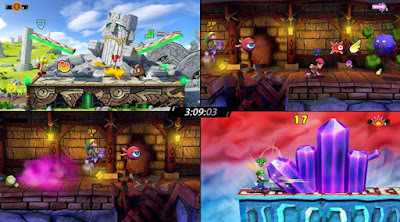 Above you can see a comparison of the stages in the leaked image (right) and the original 3DS version (right). However, the next couple of images have several inconsistencies that completely give away the fact that these images are all fake. This one shows some crazy multiplayer split-screen action going on. 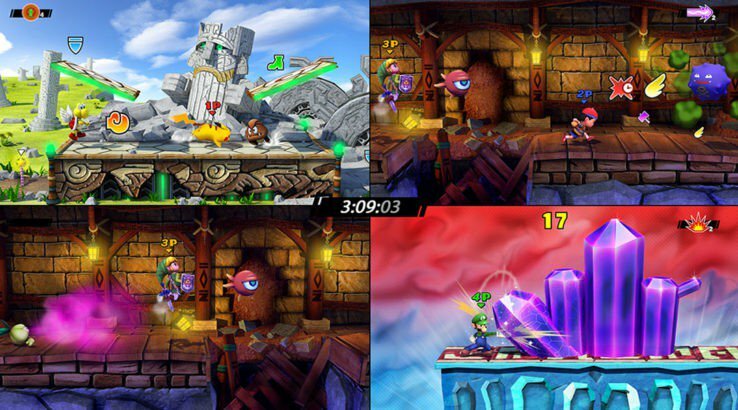 Each player is in a different place, so it mush be Smash Run mode. The problem with this is that some of the sprites are exact copies of the 3DS versions, while others aren't. 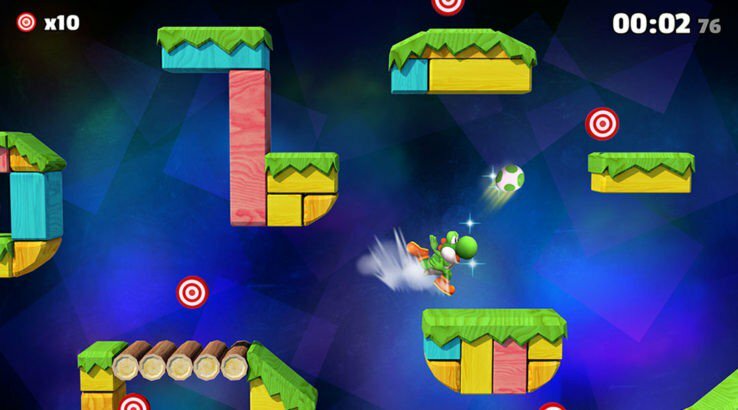 This image shows Yoshi in a brand new game mode, supposedly called "Target Smash". This image has weird shadows. Some of the shadows for the blocks are in random places. Yoshi doesn't even have a shadow himself, even though he is jumping above the ground. So is it real or fake? These images are definitely just photo-shopped and therefore faked. That doesn't mean that the game will never happen. 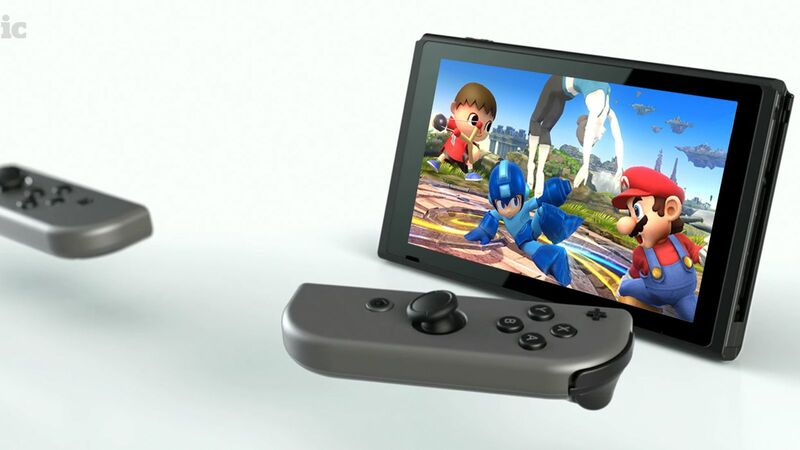 It just means that these leaked images aren't legitimate. 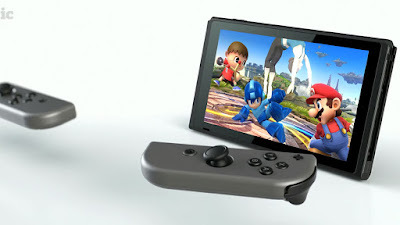 So there is still hope for anyone who wants to play Smash Bros on their Switch some day! I hope you enjoyed this post. See you next time. BBBBYYYYYYYYYYYYYYEEEEEEEEEEEEEEEEEEEEEEE!!!!!! !